Prime Minister Rami Hamdallah cancelled a visit to a village east of Jerusalem scheduled for Monday after Israeli authorities threatened to prevent the visit from taking place, Hamdallah said. Hamdallah and European Parliament President Martin Shulz had scheduled a solidarity visit to the Area C village of al-Khan al-Ahmar, where Shulz hoped to show his support for Palestinian statehood ambitions, he said. But an official told Ma'an that Israeli ministries of defense and foreign affairs threatened to use force, if necessary, to stop the visit from taking place, without providing further details. The official, speaking on the condition of anonymity, said the trip would have included a visit to the Bedouin village's school, an educational building made from tires and mud by villagers and international volunteers. The school, in addition to several of the village's residential structures, have faced repeated Israeli threats of demolition on the pretext that they were built without construction permits. A spokesman for the Israeli Ministry of Foreign Affairs did not answer calls. Al-Khan al-Ahmar is a Bedouin village in the Jordan Valley, surrounded by the illegal Israeli settlements of Maale Adumim and Kfar Adumim. Area C, which constitutes 62 percent of the West Bank, is under complete Israeli control. Israel permits Palestinians to build on less than 1 percent of Area C land, according to UN figures. 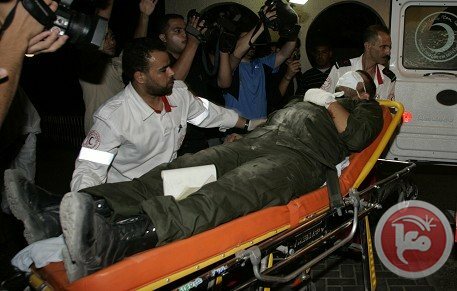 A man was injured on Monday after he set himself on fire in the northern West Bank, locals told Ma'an. Locals said a 32-year-old man in Nablus was taken to the hospital with moderate wounds, and that the motive behind his act was unknown. The man is mentally disabled, and has attempted to set himself on fire a number of times in the past, locals added. Palestinian premier Ismail Haneyya said that the Palestinian reconciliation is a strategic decision for his government and the Hamas Movement, affirming that his government has made several positive initiatives in this regard. During his meeting on Sunday with a delegation from Fatah faction, premier Haneyya highlighted the daily violations committed by the Palestinian Authority (PA) security apparatuses against Hamas members and cadres in the West Bank. 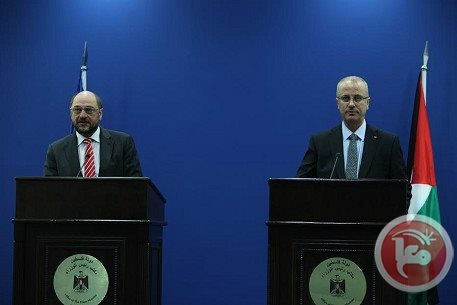 The premier asserted that the ongoing political arrest and harassment of Hamas cadres in the West Bank, and the security cooperation between the PA and Israel dissuade the Hamas decision-makers from any inter-Palestinian political settlement. The Fatah delegation was handed a letter to PA president Mahmoud Abbas urging him to necessarily take concrete steps to create a positive atmosphere for the national reconciliation. The delegation was also given a list containing the names of Fatah individuals and officials who are allowed to return to the Gaza Strip in the framework of the positive initiatives that have been launched recently by the government in Gaza and Hamas. Member of Fatah Central Committee, Nabil Shaath, who is in Gaza with a Fatah delegation, said Monday in a press conference that the reconciliation is ripe and ready to start implementation. 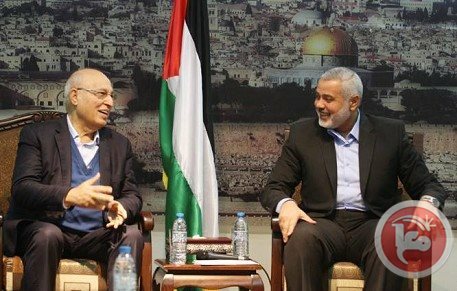 He said that Fatah official in charge of the reconciliation talks with Hamas, Azzam al-Ahmad, is set to arrive in Gaza in the next few days to seal an agreement on implementation of what the two movements had previously agreed on to reunite the West Bank and Gaza Strip after seven years of division. He said Fatah officials visiting Gaza held talks with their Hamas counterparts and agreed to speed up reconciliation efforts. Shaath also said that President Mahmoud Abbas will not agree to recognize Israel as a Jewish state or agree to presence of one Israeli soldier on Palestinian land in any future peace deal with Israel. He said Abbas would neither cancel the Palestinian right of return for refugees or accept settlements and will not agree to postpone the current negotiations by one day once they reach their April 29 deadline if the position of the US and Israel does not change. He said the negotiation could be extended for a short while if there was real progress and only minor issues are left to deal with them in order to conclude an agreement. Shaath warned that Western donors and Israel may put pressure on the Palestinians to force them to accept a deal with Israel, but that the Palestinians will not give in to that if the deal was not good for them, which means a chance the donors may cut financial aid. Deputy Prime Minister in Gaza, Ziad Zaza discussed on Sunday national core issues with representatives of several western media agencies in Gaza. During a special meeting held at the Ministry of Finance in Gaza city, Zaza made clear that the Palestinian government in Gaza does not plan to establish a Palestinian state in Gaza, adding that, no Palestinian state would be established without Gaza. He said the Palestinian government is interested in a national reconciliation and undertook practical steps towards achieving it. 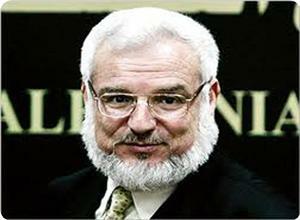 He stressed that a group of Fatah leaders and members returned to Gaza and now lead a normal life. Zaza emphasized that the government is primarily concerned with maintaining the home security which many Arab countries are seeking after nowadays. Answering a question raised by one of the journalists about the critical status quo in Gaza after the military coup in Egypt, he explained that the Palestinian government in Gaza never ever played any role in the Egyptian internal affairs, refuting Egyptian media claims. On the other hand, he said that the Palestinian government adapted a free market economy and is looking to privatize the border crossings. It gave instructions to a group of businessmen to form a committee in order to establish a Public Joint Stock Company to run the borders. In an Interior Ministry office somewhere in Gaza stands an ancient bronze statue of the Greek god Apollo, discovered last August by a local fisherman and valued at $20 million to $40 million or more, Bloomberg Businessweek reports. The discovery is credited to Gazan fisherman Jouda Ghurab, 26. However, Ghurab's claim to have come upon it in the waters off the Gazan shore is disputed by foreign archeologists who've seen photos and videos of the statue; they say there would have been sea encrustations and water damage if it had lain in the sea for centuries. At first Ghurab and his family tried to sell the statue, which is estimated to be 1,800 to 2,500 years old. At one point it turned up on Ebay at an opening price of $500,000. But the Gaza Strip's isolation and the difficulty of transferring the statue to a buyer made the idea of selling it unworkable, so Ghurab turned it over to Gaza authorities – with the understanding that he would receive a reward. The Louvre has expressed interest in preserving the statue. An unnamed American museum has also been in touch with the Strip's authorities about caring for the find. "We are keeping the door open to cooperation with any government," said Muhammad Ismael Khillah, assistant undersecretary of Gaza's Ministry of Tourism and Antiquities. He said a public exhibition in the Strip was also a possibility. "We will have to cover it in certain places," Khillah said. Hamas and Fatah will hold meetings to discuss the implementation of a national reconciliation agreement on Sunday evening and Monday morning, members of both movements told Ma'an. 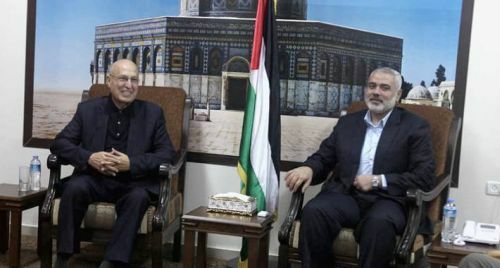 Fatah official Nabil Shaath and Hamas official Khalil al-Hayya said they considered reconciliation a top priority, and that an earlier meeting between a Fatah delegation and Gaza Prime Minister Ismail Haniyeh was a success. "We realize that the road to freedom and independence is still a long one and needs a lot of work, and the first step is Palestinian unity," Shaath said. "There cannot be a state without Gaza," he said. 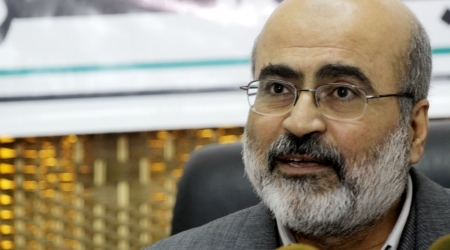 Shaath also praised Hamas' recent decision to allow Fatah lawmakers to return to Gaza. "We at Hamas want to be united with Fatah and not interfere in Fatah internal issues," he said. Al-Hayya said Hamas had sent a letter to Palestinian Authority President Mahmoud Abbas, saying "that we support him in his position of protecting our principles." 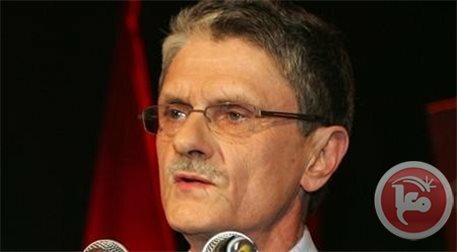 Dr. Ahmed Bahar, First Deputy Speaker of the Palestinian Legislative Council, hailed the Danish Parliament Speaker Mogens Lykketoft's planned visit to Ramallah and the Gaza Strip, without visiting the Hebrew state, and considered the move a step in the right direction. Bahar warned of the Israeli occupation's attempts to prevent the visit, stressing that "preventing the visit does not serve the democratic process, and represents a clear violation of the rights of travel and movement." He also called on Lykketoft to press ahead with his visit, and to make more efforts to ensure the release of the kidnapped Palestinian MPs held in the Israeli jails. Bahar called on the heads of parliaments around the world to follow the example of their Danish counterpart, and organize visits to Gaza that is suffering a humanitarian tragedy beyond all perceptions. He also stressed that "the visit comes in the context of humanitarian efforts aimed at alleviating the suffering of the Palestinian people in the Gaza Strip", and praised the efforts of international and human rights organizations in Europe and the members of the parliaments who are working to expose the Israeli occupation’s practices against the Palestinian people. Prime Minister of Hamas government in Gaza, Ismail Haniyeh Meets today "Sunday" afternoon with Fatah Central Committeea delegation visiting gaza strip.In a brief statement Hamas government in Gaza Strip Announced 'that Haniya will meet with Fatah Central Committee delegation in his home tomorrow afternoon to discuss reconciliation in order to reach possibility to end to the division . Fatah Delegation Which includes Nabil Shaath, Jamal Muheisen, Sakhr Bseiso, Muhammad al-Madani, arrived yesterday via Beit Hanoun "Erez" to hold meeting with leaders and also to held meeting. Ismail Haneyya, Gaza premier, told a delegation of independent figures on Saturday that his government was adamant on achieving reconciliation. Hanneya, according to a statement for his office, held an in-depth discussion with the visiting delegation on reconciliation. It pointed out that the delegation handed the premier a message expressing appreciation for Haneyya’s recent steps taken to furnish the atmosphere for reconciliation including the release of detainees and allowing entry of Fatah MPs into Gaza. Haneyya called for reciprocal steps in the West Bank in a bid to accelerate national reconciliation and end the internal division. The statement noted that the discussion tackled the settlement process and agreed on rejecting any surrender of national rights or constants. 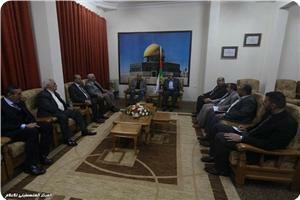 A senior delegation of Fatah movement arrived Friday in Gaza to study organizational affairs. The PA delegation , comprised of Nabil Shaath, Jamal Muheisin, Sakhr Bseisu and Muhammad al-Madani, was welcomed by Gaza government officials upon their arrival as well as many Fatah movement supproters. The delegation members are commissioned by President Mahmoud Abbas to rearrange the movement ranks in Gaza and develop appropriate solutions to get out of the internal crisis of the movement there. Shaath said in a press conference upon arrival that "the delegation's visit comes in the context of the realign the organization's house in Gaza," stressing the need for restoring Palestinian reconciliation and ending the political division. Palestinian medical sources have reported that two Palestinian fighters were killed, on Friday at night [February 7, 2014], in two separate incidents, in the besieged coastal region. 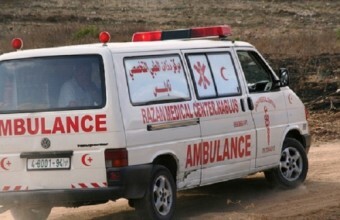 Spokesperson of the Ministry of Health in Gaza, Dr. Ashraf Al-Qudra, stated that one fighter was killed, and one Palestinian was moderately wounded, in an explosion that took place in the al-Boreij refugee camp, in central Gaza. The fighter, Hani Hussein Salama, 27 years of age, is a member of the al-Qassam Brigades, the armed wing of the Hamas movement. His body was severely mutilated and his remains were moved to the al-Aqsa Martyrs Hospital. Furthermore, another fighter identified as Ibrahim As-Sa’eedy, 25 years of age, was killed, and two Palestinians were injured in an explosion that occurred east of al-Boreij. The Police and Ministry of Interior in Gaza stated the causes of the two blasts remain unknown, and that the Police is currently investigating the two incidents. A Fatah Central Committee delegation arrived in Gaza on Friday as part of a visit to review the situation of Fatah in the coastal enclave. Fatah spokesman in Gaza, Fayiz Abu Aita, told Ma'an that the delegation consisted of Nabil Shaath, Jamal Muheisin, Sakhr Bseisu and Muhammad al-Madani. 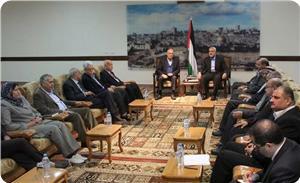 The delegation was greeted by Fatah and Hamas leaders, including Basim Naim, Ghazi Hamad, and Taher al-Nouno. Abu Aita said that the delegation will examine the movement's internal organization and determine any difficulties faced by Fatah in Gaza. The length and schedule of the visit have not yet been determined. Last week, the leading body of the Fatah movement in the Gaza Strip submitted its resignation to President Mahmoud Abbas. An official, speaking on the condition of anonymity, told Ma'an that Gaza's chief Fatah leader Zakariyya al-Agha submitted the body's resignation in protest against interference in Gaza affairs by the Fatah Central Committee. Fatah's Central Committee has formed a legal committee to study the possibility of creating a new position for a vice president in the organization, member Mohammad al-Madani said Friday. Al-Madani told Ma'an that it was suggested during the last two meetings that a new position for a vice president be created, and as a result of that suggestion a committee led by Salim Zanoun was formed to examine the issue. Appointing a vice president would require a presidential decree and an approval from the legislative council. A young Palestinian was killed and two others were injured on Friday evening in an explosion east of al-Bureij refugee camp in the center of Gaza Strip, medical sources said. Ibrahim al-Saidi, 25, was pronounced dead upon his arrival at Shuhada al-Aqsa hospital in Deir al-Balah. Spokesman for the Gaza police Ayub Abu Sha'ar confirmed that one man was killed and two injured in an explosion in the central Gaza Strip. Police are investigating the cause of the explosion, he added. Israeli Prime Minister Benjamin Netanyahu draw the lines for a final agreement with the Palestinian side and presented a proposal and a vision of a map for the future State of Palestine. 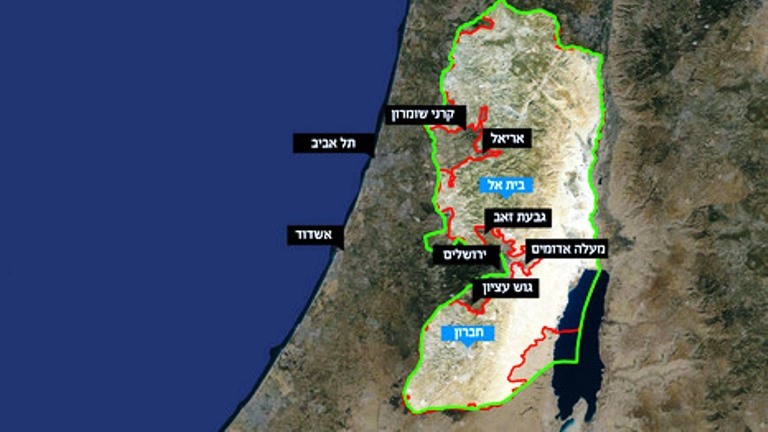 According to WALLA news site in Hebrew, Netanyahu wants to keep 10% of the West Bank land under Israeli sovereignty and control, adding that Netanyahu is ready to give up 90% of the territories occupied in 1967 . According to Israeli news source, Netanyahu has faced rejection from Knesset members from the right-wing parties and his Likud Party but he stressed that the annex of 10% from the West Bank under the Israeli sovereignty will be an important victory because of the importance of land in this ratio. The 10 % that netanyahu is talking about includes: Gush Etzion, Efrat, Ma'aleh Adumim and Givat Ze'ev and parts of Hebron city on which Israeli settlements of Kiryat Arba, and Ariel were built. In addition to the settlements that were constructed along the Green Line, and the old settlements of Karni Shomron, Ma'aleh Shomron and Kedumim. The Israeli source said that Netanyahu is ready to give Palestinians any compensation to agree on the Israeli offer but the Palestinians refused it. A source on the American side said that the two sides have not yet talked about percentages of the land exchange, but the outposts Israel is willing to keep have a percentage of 10-11% of the West Bank land, adding that the image is not clear yet. The source added, "it is clear" that Israel is "willing in principle to give up" control of 90% of the West Bank. As part of a compensation- according to WALLA- Israel should be provided with a land in the Gaza Strip surrounding area, in addition to creating a "safe road" linking the West Bank and Gaza; an idea which was complicated by the security situation in the Strip, that is controlled by the Hamas. The 64-year old Taha Shafiq Khayyat is in the intensive care unit at Hadassah Ein Kerem hospital after he was attacked by unknown assailants while coming back from Jaffa Street in West Jerusalem after he had finished some personal matters last Wednesday. Ahmad Awad, one of Taha’s relatives, said that the family received a phone call on Wednesday from a social worker to inform them that Taha was injured in a traffic accident and had been transferred to Hadassah Ein Kerem hospital. Awad explained that Taha has been in a coma since Wednesday and signs of assault were obvious, especially on the head and face; note that he was in West Jerusalem on Wednesday and the doctors say that the injuries are a result of an assault and not a traffic accident. The blockade -- which is maintained with Egyptian support -- has severely limited the imports and exports of the Gaza Strip and has led to frequent humanitarian crises and hardship for Gazans. Dorgham Abusalim is a master's candidate in International Affairs at the Graduate Institute of International and Development Studies in Geneva. He writes frequently on Palestinian and Israeli affairs in Arabic and English. Many, including analysts of Palestinian affairs and onlookers alike, await the end of current negotiations with Israel. Some are skeptical, others are hopeful. But almost everyone agrees: the status quo is not durable. Despite this, we continue to find a leadership incapable of making durable decisions, simply driven by the heat of momentary, so-called victories in three dimensions throughout its history: militant, political, and diplomatic. 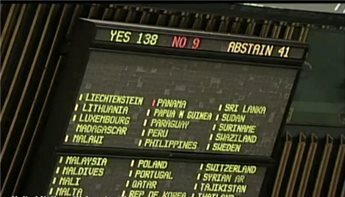 A recent victory of the diplomatic kind is the new status accorded to the PLO at the United Nations General Assembly. Today, we are a non-member Observer State of the United Nations. Gaining the new status has also gained us a fair share of intricate legal debates, appropriately so. Little was said from the Palestinian side, however, once this new status was achieved. After all, it seems that our leadership has confined the role of international law to a mere bargaining card for the negotiating table with Israel. The scenario goes something like this: should Israel negotiate in bad faith, we will be able wave the threat of pursuing international jurisdiction over crimes committed on our soil. The answer is not a definite yes, nor is it a definite no. Noting the debate surrounding the issue is nonetheless worthwhile. Particularly because in April of this year our leadership reportedly decided to pursue international legal efforts should negotiations fail, albeit with rumors of possible delay surfacing recently. Any sovereign state can exist without being a UN member, as was the case with Switzerland prior to joining the organization. Being a UN member does not necessarily establish statehood. This distinction is because of different criteria concerning statehood and UN membership. The UN membership criteria is summed up in Article 4(1) of the UN Charter: "Membership in the United Nations is open to all other peace-loving states which accept the obligations contained in the present Charter and, in the judgment of the Organization, are able and willing to carry out these obligations." Palestinian leadership has repeatedly stated that we are peace-loving and, in the heat of the moment, gave a misguiding impression of what really happened on Nov. 29, 2012. Others suggest that to exist as a state, Article (1) of the Montevideo Convention must be fulfilled: "The state as a person of international law should possess the following qualifications: a) a permanent population; b) a defined territory; c) government; and d) capacity to enter into relations with the other states." A simple look at Palestinian affairs inevitably leads to the conclusion that our fulfillment of each of these criteria are at best debatable. While there is a defined Palestinian population, most of it is considered stateless and is not governed by Palestinian state institutions; the borders of Palestinian territory remain undefined, pending a resolution with Israel according to previous PLO-Israeli agreements; those of us who reside in the relevant territories are governed by two regimes (Hamas and the PLO), neither of which truly constitute a government; and unless we consider the PLO a state, it can be said that, up to the point of acquiring the new status, no Palestinian State body has entered into relations with other states. Beyond the distinction between statehood and UN membership, the resolution according a new status to the PLO has an intriguing point that is worth highlighting. The new status is given "without prejudice to the acquired rights, privileges and role of the Palestine Liberation Organization in the United Nations as the representative of the Palestinian people, in accordance with the relevant resolutions and practice." It is possible that preserving the role of the PLO can hinder Palestine's legal standing. Are we the only people who exhibit symptoms of legal schizophrenia at the United Nations? Because the PLO remains the sole actor representing us on the international stage, the new status provides little, if any, concrete legal grounds for the birth of a Palestinian state. Meanwhile, international law is not concerned with questions of internal affairs, including questions of legitimate representation or lack thereof. It remains up to us to determine whether the PLO is indeed our sole and legitimate representative. It is evident that the recent activity of the PLO was merely political, filled with international legal question marks that remain unanswered. Is pursuing international legal jurisdiction the answer? Not necessarily. In 2009, following the aftermath of Israeli aggression during Operation Cast Lead, our leadership recognized the jurisdiction of the International Criminal Court, inviting investigation and prosecution of crimes committed on Palestinian soil since July 1, 2002. The Court's answer then was clear: it is contingent upon the "relevant bodies at the United Nations or the Assembly of States Parties" to legally judge if Palestine qualifies as a state "for the purpose of acceding to the Rome Statute and thereby enabling the exercise of jurisdiction by the Court." Today, with a new acquired status, the case is not fully promising. Even if our statehood is confirmed through recognition from more states, international legal jurisdiction requires signing and ratifying relevant statutes that go both ways. Many Palestinians could be the subject of investigation. Also, inviting jurisdiction over certain territories but not others could complicate the matter further on the political front. Over what territory exactly could a Palestinian authority invite international jurisdiction -- the Gaza Strip, the West Bank (Area A, B, or C), or East Jerusalem? Lastly, an issue that will certainly ignite contentious debates is that of retroactivity. Over what period is jurisdiction applicable —before or after the relevant statutes have been ratified? The questions are intricate. The answers will rely on the international legal establishment, irrelevant of political circumstances. Subsequently, the decisions of either the International Criminal Court or the International Court of Justice will be legal, not political. Acquiring a new status necessitates acquiring a deep understanding of its legal duties and rights beyond momentary decisions. More importantly, given the little success of the militant and political dimensions, we are better off arranging our home behind a single democratically elected leadership to enhance our standing. Otherwise, once again, Palestinian efforts stand the risk of becoming the laughing stock of skeptics and enemies alike. 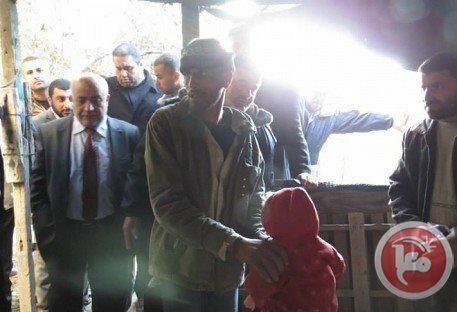 A toddler from the Gaza Strip who was reported missing in December was murdered by her uncle, police said Thursday. The body of Hadeel al-Souri was found on Tuesday after her family reported her missing a month earlier. Her body was found buried in an area two kilometers from her house in al-Nuseirat, near Gaza City. Police arrested her uncle after passersby reported three men digging in a deserted area. The suspect, who was not identified, was taken to the crime scene to reenact how he killed his niece. He told police that he smothered the young girl to death, although the the motive behind the murder is unclear. Former Fatah strongman Muhammad Dahlan on Thursday denied media reports that he had met with an Israeli official as part of discussions to be a potential replacement for President Mahmoud Abbas. Earlier, Israeli daily Maariv reported that Benjamin Netanyahu had sent his political adviser Yitzhak Molcho to Dubai to meet with the former Fatah official. The move was described as an attempt to build good relations with Dahlan as a potential political partner if Israel and the PLO fail to reach an agreement in ongoing peace talks. Israeli officials reportedly believe that Dahlan's popularity in both the Gaza Strip and West Bank make him a suitable replacement for Abbas, Maariv said. Dahlan told Ma'an that he has not met with Yitzhak Molcho for personal or political reasons since the late 1990s, when both officials were involved in negotiations. 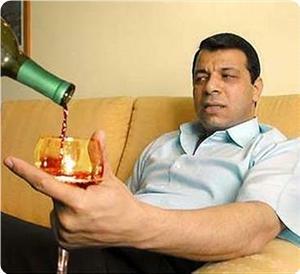 Dahlan called the Maariv report pure "fiction" and said that people like him would never accept what the Israelis are proposing in peace talks. A former security chief in the Gaza Strip under Fatah, Dahlan fled the West Bank after his ouster from the party in 2011, after which security forces raided his home. Fatah's Central Committee said at the time that he was expelled for harming Palestinian national interests and coercing outside parties to commit crimes over a number of years. 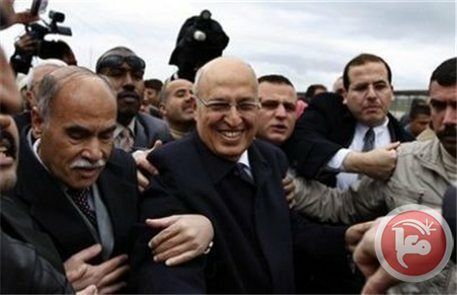 Leaked reports also said that the former Fatah strongman in Gaza was building a private armed militia in the West Bank. Dahlan denied the allegations. Israeli premier Benjamin Netanyahu sent a few days ago his personal envoy Yitzhak Molcho to Dubai to meet with former Fatah leader Mohamed Dahlan, a notorious Palestinian strongman, according to a report by Maariv newspaper on Thursday. Maariv expressed its belief that Israel seems interested in restoring its contacts with Dahlan in preparation for the possible resignation of Mahmoud Abbas from his post as president of the Palestinian Authority. It noted that there are top Israeli officials who think that Dahlan could be a good peace partner rather than Abbas who would, most likely, not be able to sign a permanent settlement agreement with Israel. 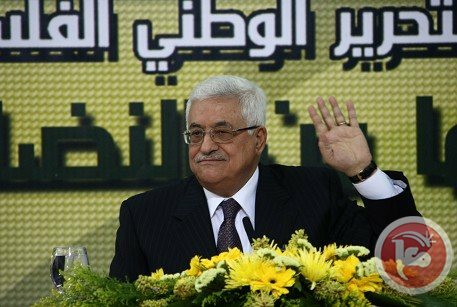 Fatah expelled Dahlan from the party in June 2011 because of his repeated criticism of Abbas. 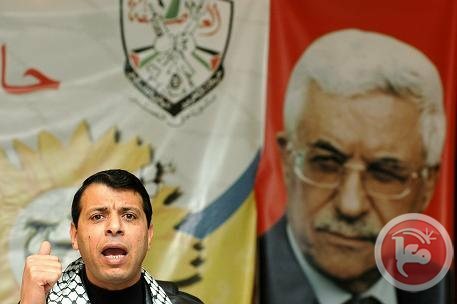 Dahlan has once accused Abbas of being a weak leader and allowing his sons to benefit financially from his rule. 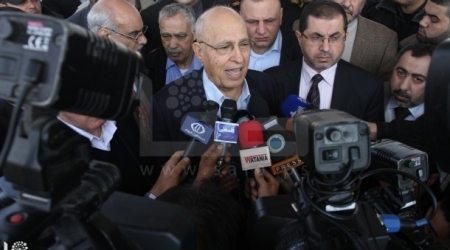 Speaker of the Palestinian legislative council (PLC) Aziz Dweik said that the national reconciliation would not see the light of day if the Fatah-controlled Palestinian authority persisted in arresting citizens for their political affiliation in the West Bank. In televised remarks to Al-Aqsa satellite channel on Thursday, speaker Dweik stated that Fatah should have reacted positively to premier Ismail Haneyya's goodwill gesture towards the reconciliation and his efforts in this regard. He stressed that there are concrete steps being notably taken by the Palestinian government in Gaza to create a reconciliatory atmosphere, and other steps taken in the opposite direction by the PA in the West Bank. The lawmaker added that Fatah continues its political arrests against citizens because of their affiliation with or support for certain factions, while its members are allowed to return to Gaza and not exposed to arrests. He called on Fatah and its authority in Ramallah to give the national reconciliation priority on their agenda and renounce "the concept of victors and losers" for the greater good of the Palestinian people. Islamic Jihad leader, Khaled al-Batsh called the Palestinian president Mahmoud Abbas to complete the Palestinian national reconciliation and to respond positively to Prime Minister Ismail Hanyieh initiative as a part of the Palestinian national liberation project. This came during a stand organized by the movement , on Wednesday, in support of the Palestinian detainees in the occupation prisons. Al Batsh denounced the Arab and International silence over the Palestinian detainees in the occupation prisons who are on hunger strike and suffer from difficult conditions. He hold the Israeli occupation the full responsibility of the detainees’ lives and insisted on the importance of continuing supporting activities towards the Palestinian detainees, pointing out that resistance is the only way to release all Palestinian detainees from Israeli prisons . 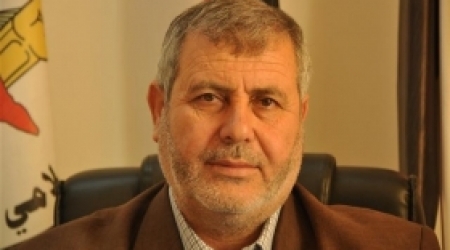 Al Batsh reprehended the political arrest of Hamas and Islamic Jihad member by the security forces of Ramallah government and called the Palestinian president to take prompt measures to stop the acts that could deepen the political division between Fatah and Hamas. 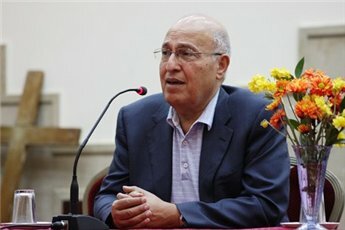 “we stand in place that was a central prison for the occupation in the past and today we ask to release all Palestinian detainees from the occupation prisons and we send this call also to the PNA to put an end to the political arrest” Yasser Saleh, the chairman of Muhjat al-Quds Detainees Foundation said. Participants in the stand raised the Palestinian flags and chanted for the release of the Palestinian detainees in occupation prisons with the presence of Islamic and national leaders in Gaza strip. A delegation of four Fatah officials is scheduled to visit the Gaza Strip on Friday, an official from the movement said. A Gaza-based member of Fatah's Central Committee, Amal Hamad, told Ma'an that the delegation will review the situation of Fatah in the coastal enclave. The delegation will consist of Nabil Shaath, Jamal Muheisin, Sakhr Bseisu and Muhammad al-Madani, who will report back to President Abbas following the visit. Gaza Prime Minister Ismail Haniyeh has instructed security forces to accommodate the visit and said that the Fatah officials would be welcome in Gaza as part of creating a positive atmosphere for reconciliation talks.